This is a really simple dish that looks like you’ve made a bit of an effort. It makes a lovely veggie main course and would make a great accompaniment to some barbecued meat this summer. Preheat oven to 180°c (160°c fan) gas 6. Halve the aubergines and scoop out the centres leaving 1cm thickness. Oil lightly, sprinkle with sea salt and put into a baking tray, cut side down. Chop the aubergine flesh into small cubes and set aside. 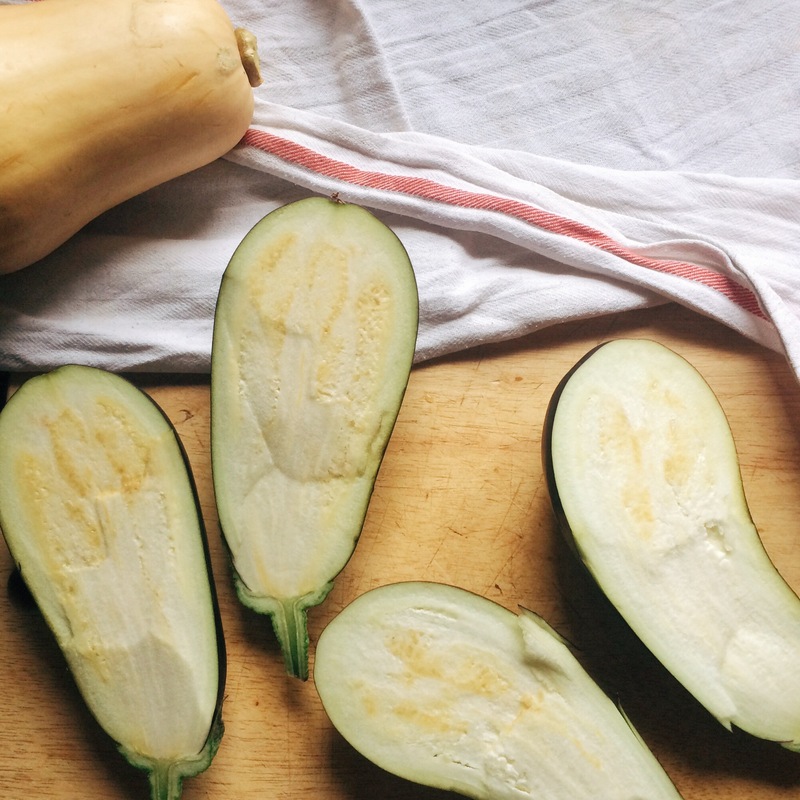 Peel and chop the squash into similar sized pieces and put into another baking tray with some olive oil, a sprinkle of sea salt and the cumin seeds. Place both trays into the oven for around 20 minutes. Remove from the oven. In a bowl mix together the aubergine and squash cubes with the chopped walnuts and snipped chives. Crumble in the feta, mix well and season. 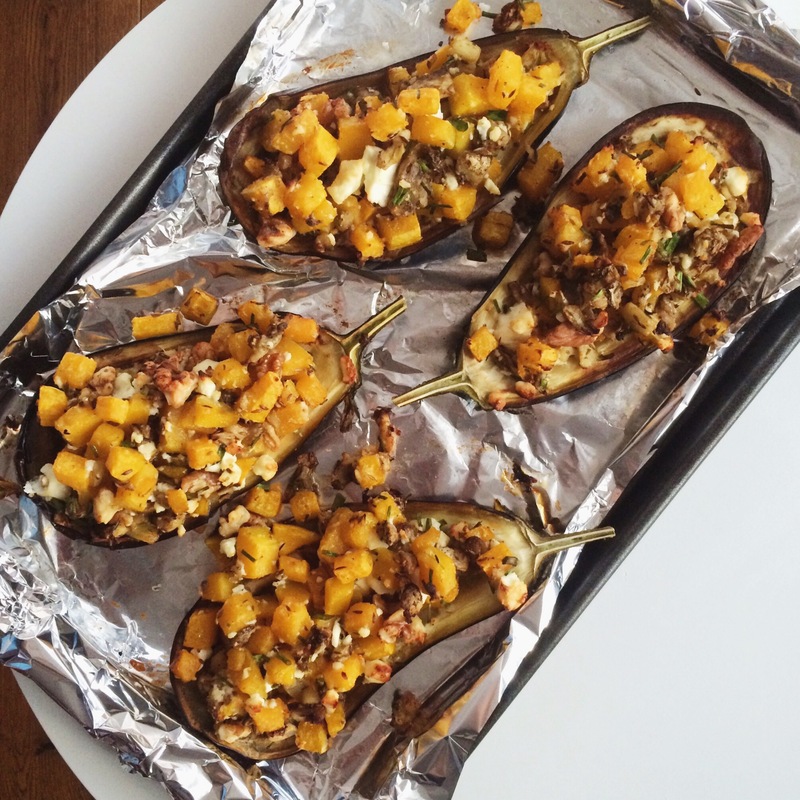 Fill the aubergine skins with the mixture, drizzle with a little more oil and bake in the oven for a further 20 minutes. Serve alongside some green salad. Enjoy! Serves 2 as a main (or 4 as a side dish).